If you are a Star Wars fan that likes to build then you should check out this LEGO BB-8 figurine. 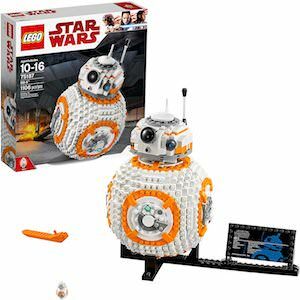 The BB-8 LEGO set is number 75187 and includes 1106 pieces that will make a 9 inches tall and 5 inches wide and even comes with his own stand so that the Star Wars droid can be on display in your home. This is a fairly big Star Wars set to build but it will be worth you time as it looks amazing and just building your own Star Wars droid will be lots of fun too and you can do it all by yourself or do it with friends or family. Now there is a Star Wars BB-8 Christmas sweater that you can show of at the holiday party this year. 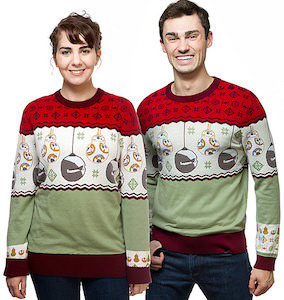 The Star Wars Christmas sweater is unisex and that means that now there is a fun sweater for both men and women. The sweater is red at shoulder level and the bottom part is green and in between it is white and there you can see what could be just typical Christmas decorations but they are actually BB-8 and Starkiller base balls making this sweater festive and perfect for a Star Wars fan. You new BB-8 Christmas sweater is available in sizes Small – 3XL and is made from 100% cotton. If you like to eat cookies and watch Star Wars movies then you just need this BB-8 ceramic cookie jar. This Star Wars cookie jar is 12 x 6 x 6 inches and it looks like a BB-8 figurine on a wooden base but it is all ceramic and you can take the head off BB-8 and that is how you get inside the cookie jar. A cool cookie jar like this is made to last and this could be one of those items that can be passed on to other generations in your family. Get your own Star Wars heirloom that can store your favorite cookies. If a Star Wars birthday is what you are planning then check out this BB-8 cake pan so that you can bake the perfect cake. The BB-8 cake pan is made from silicon and that makes it not only perfect for the oven but you could use it in the freezer too and that means you can make a normal cake or maybe an ice cream cake. Star Wars fans will love the cake even if there is no icing on it as the cake is shaped just like the ball shaped droid with many of its body features build into the cake pan. Now you can time your cooking to the minute thanks to this Star Wars BB-8 kitchen timer. The kitchen timer looks a lot like the real BB-8 only this droid comes on a nice Star Wars base and you can turn the top to choose the time. 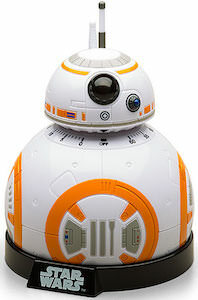 Your new kitchen timer can be set between 1 and 60 minutes and BB-8 will make a bleep sound when time is up. No more boring plain kitchen timers for you all thanks to this amazing looking Star Wars timer that is almost too nice to have in the kitchen. Now your Christmas decorations at home can include a Star Wars stocking that has BB-8 on it. 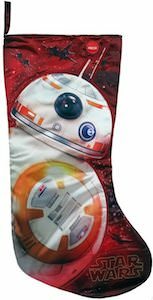 This 17 inches long Christmas stocking has a red background that also has the Star Wars logo on it and on top of all that a big picture of BB-8 one of my favorite droids. And to make this BB-8 Christmas stocking even better they added sound effects to it that will play with you press the button on the top. Bring Star Wars to your Christmas by adding this BB-8 stocking to you holiday traditions. All you want for breakfast is BB-8 waffles if you had the opportunity and that opportunity just became a reality thanks to this Star Wars BB-8 waffle maker that makes perfectly shaped BB-8 waffles. The waffle maker just makes Star Wars waffles that looks like the ball droid and yes it does have ridges and edges to hold your syrup and other topics and those ridges all fit into the BB-8 droid design. 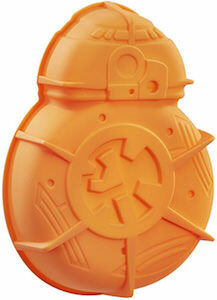 And yes this is an officially licenced Star Wars product that should be part of every Star Wars fan’s kitchen. 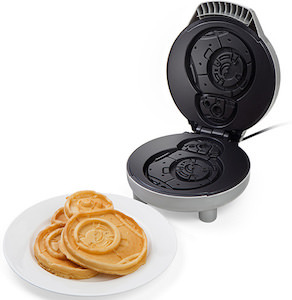 No more boring looking waffles thanks to this Star Wars waffle maker that makes BB-8 waffles. 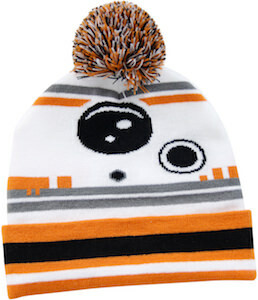 Star Wars fans that like a cool winter hat should check out this BB-8 beanie hat that is made just for them. This 100% acrylic hat looks just like BB-8 the ball-shaped droid only, this time, the ball shape comes from your head as that is where the hat will live on cold days. Made to fit most adults this BB-8 hat is just perfect for those cold days out. The colors make this hat really look like BB-8 and having that on your head, of course, has to be fun. 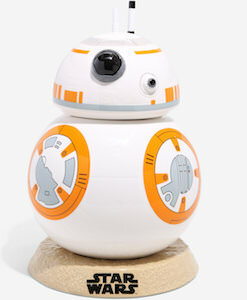 And to top it all off they added a fun pompom on the top so that BB-8 even look more amazing. This kids Halloween costume will transform them into BB-8 the droid from Star Wars. 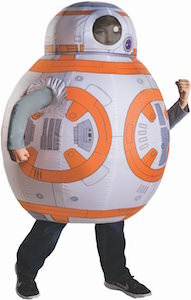 And it is an inflatable costume so you child will look like a big round BB-8 just like the real robot in The Force Awakens movie. The Halloween costume is made for kids ages 5 – 8 and it will be a hit with your child and everyone that sees them wearing them. Besides Halloween, this Star Wars costume is great for cosplay and dress up too so that it can be used multiple times for extra fun. Make a kid happy by surprising this with this awesome BB-8 Halloween costume! Toddlers and little kids are in luck as there now are Star Wars BB-8 shoes that light up when you walk. 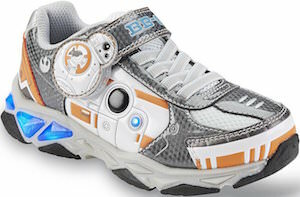 These Star Wars sneakers are grey, white, and orange and have BB-8 on the side and on the top strap and in the sole, you find blue shaped that will light up with every step your child takes. If you kid likes Star Wars and droids then don’t wait and surprise them with this special pair of BB-8 shoes.